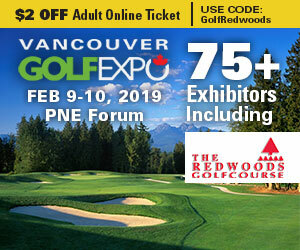 We will be an exhibitor at this year's Vancouver Golf Expo! Come to visit us at booth #332, right across from the retail store! Purchase your Expo tickets ahead of time with the code: GolfRedwoods & save $2 on an adult ticket! 2 Green Fees valid any day, weekends after 12 pm, for $114 + tax! You save $26! 2 Senior Green Fees valid weekdays for $89 + tax! Must be 60 years + upon redemption. You save $18! Primetime foursome golf as a foursome any day, anytime for $269 + tax! You save $49! SHOW ONLY OFFER: Add a Power Cart to any green fee purchased for only $20! You save $20! NEW THIS YEAR: Can't make it to the show? No problem! All green fee packages (excluding power cart add-on) will be available for purchase in our online store on Feb 9th & Feb 10th! What to learn more about the GolfExpo?